Ignore the lumps in the glaze. Was too tired to whisk them out. For whatever reason, the lack of sleep has hit me particularly hard today, and I’m pulling a blank on trying to remember things. Probably not the wisest time to bake something, but hey, it’s bake-a-long time and I’m a-gonna bake! This week my bake-a-long group is baking Dorie Greenspan’s Fluted Carrot Tangerine Cake, from her Baking Chez Moi cookbook. 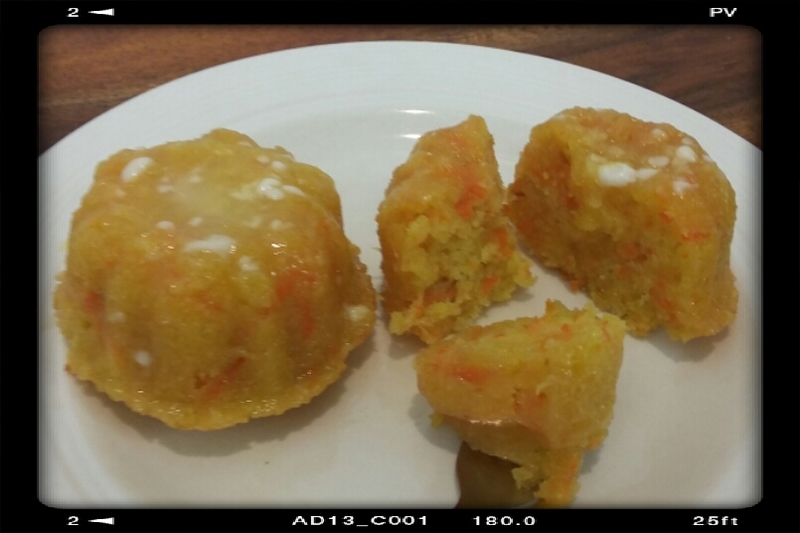 It’s supposed to be a French version of carrot cake, with a citrus and ginger kick. And the way I’m weaving from exhaustion, I could use the kick! 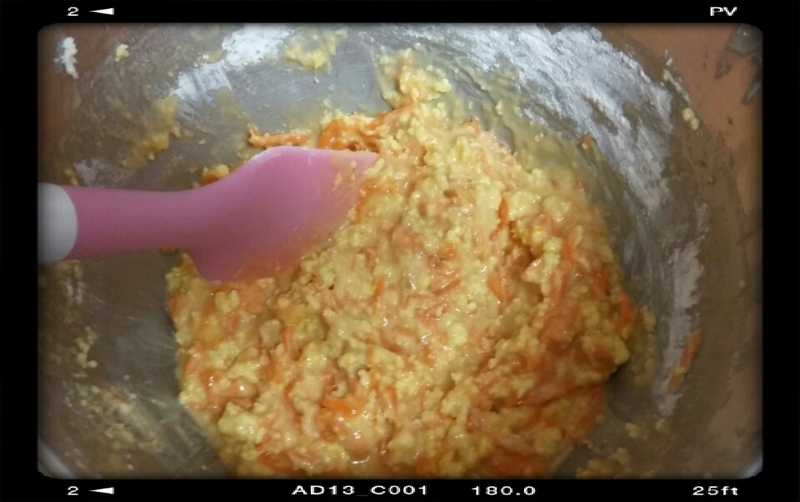 After you mix the egg/butter/sugar mixture with the carrot/ginger/orange mixture and add in the orange juice, Dorie says that the resultant mixture will look curdled and that that’s ok. It definitely looks curdled. She also says that once you add in the dry ingredients, that the mixture will ‘look pretty’ again. So not the case with my batter. Still looks curdled. Just…smaller curd. Appetizing, yes? Eh. When I’m this tired, almost perfect is good enough. So curdled or not, I’m putting this batter in the pan and baking it. I still wonder why it’s so curdled; I measured everything carefully. With the exception of the butter. I don’t have a food scale in my kitchen, so I kind of just eyeballed the butter. That’s the only possible variable, and yes, I recognize that it’s a big one! Update to look in the oven: It’s rising! Not sure why Dorie says the cake will only be an inch high; it’s at least two inches high and going for broke. I’m sure I used the correct amount of baking powder. Pretty sure, at least. I’m too tired to think straight, frankly. Final Update: They turned out! The fluted carrot cakes taste rather yummy, or as the DH said after the first bite: “Oh my god, these are sooo goood!” The little cakes have the texture that I imagine Baba au Rum cakes to have, all dense and moist and heavy, especially after the addition of a orange-juice-and-icing-sugar glaze. These cakes are a mini meal in themselves, and I can totally see serving them with a good, strong cup of coffee. Diet-friendly, no, but taste-bud-friendly? Yuppers! Next Post: Adventures in Indian Food, Part II. In which I take chana masala and up the spice factor by 100. On purpose, really! Mostly. Ok, so…accidentally. But it still turned out! Stay tuned…. This entry was posted in Cook-a-Longs R Us on January 12, 2016 by Margaret. Right you are butter makes everything better. The cakes look so cute. Wow – sleep-baking this is a first! I think your cakes rose much higher than most because when it’s baked in a 9inch quiche or tart pan, the batter is spread much thinner. I like your mini versions! Oh! I had insomnia for a full month last year and I thought I was going crazy after a while! I am impressed you pulled this off so late and did a great job as well! Insomnia is a horrible thing. But these cakes? Like you said, tasty! Curdled or not, your batter turned into beautiful cakes! I hope you get some sleep! Thanks, they tasted pretty good too! 🙂 And yes, sleep, so freaking good! Your mini cakes are just adorable! I hope you had a good night last night and are well-rested this morning. recipe, very tasty and delicious. Love the mini cakes! Sorry you couldn’t sleep-have you tried herbal tea with valerian root? It always makes me sleepy. I’ve tried herbal teas, but not valerian root. I’ll have to look into that, thanks! I love the mini cakes! I didn’t have a fluted pan and had to go with plain. Yours are cute! I like it that you’ve made into mini cakes! How cute! Wishing you a good night sleep. These look perfect and I look forward to making it. Zombie baking! Look– you are such a good baker you can do it on auto-pilot! I try not to bake when I’m tired, as weird things have been known to happen. Cooking, sometimes, too. I love your little cakes and I agree – butter makes everything better. I finally caught up on this on the blog today and I thought it was fantastic, too. Butter totes makes everything better! I could never be a vegan (despite being a vegetarian) for exactly this reason.